Great for Kids, affordable thanks to orbitz, large statues give the resort a Disney Feel. Rooms are very clean, bright and functional. The resort bus transportation is quick and efficient, definitely an upgrade after driving to Disney for years. The food court has all of the basics for a family with a variety of palates. Once the skyliner opens in the fall this will be among the very best of Disney Resorts. Property was fine. Well spaced with trees covering the building so that you really felt the place was a private resort. Décor inside and outside decorations were fun. Clean and comfortable . The property was updated to the Murphy beds that was a nice addition as well as coffee in the rooms. The bathrooms were nicely done but you should now that they have walk in showers now-- no bath tubs. Good breakfast and dining options. Close to parks and excellent bus service. Overall, nice hotel. Requested king and got 2 queens. Did not get a new bar of soap daily. Stayed in newly renovated room in building 7. Bed and pillows much more comfortable than a couple years ago. Changes to room are great. Plenty of USB ports, big tv, fridge, Murphy bed to make small room seem big and usable. Great update. Really enjoyed our stay. The center pool was warmer than the bowling pin pool nearer to our room so we swam there. Very good! We always stay here. The food court is big and opens from 6am to midnight. The pools were very good for kids. Solid hotel. Lines to parks were always long though. Wonderful walking trsil/spaces. Clean everywhere. StFf so cordial! Bus transportatuon great. Cafeteria needs modernizing; h in omelet not tasty. Room amenities great! Great value with all the perks of being on property. Even the furthest rooms really aren't that far from the lobby/food court/park transportation. Lots of fun going on at the resort too. Good value- friendly staff. Great drinks at pool with accomodating bartenders. Check in took longer than I would have liked-however I didn’t know about online check in. There was a staff member assisting with the line for check in which was helpful. I Suggest you do not agree to have luggage sent to your room. We arrived before check in so we left our luggage in luggage room. Attendant said he would receive text when my room was ready and take bags to room. Consequently I tipped him. Unfortunately we waited close to an hour for our bags to be brought up (after we called to inquire). I purchased park tickets from concierge. She was very knowledgeable and offered many tips. Located in Bay Lake, Disney's Pop Century Resort is within a 10-minute drive of popular attractions such as ESPN Wide World of Sports and Disney's Boardwalk. This 3-star resort welcomes guests with conveniences like an outdoor pool, free in-room WiFi, and a free airport shuttle. For your convenience, a full breakfast is served each morning for a fee. This resort has a restaurant that's perfect for a leisurely bite to eat. A TV comes with cable channels, and guests can stay connected with free WiFi. Other standard amenities include a hair dryer, a safe, and a phone. 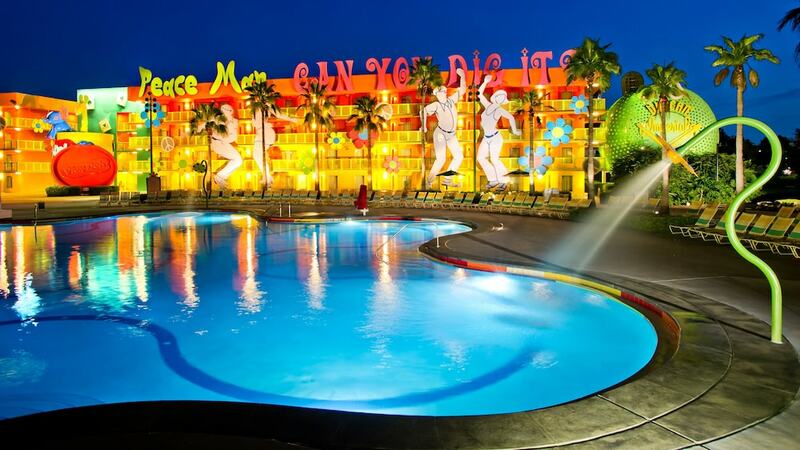 Guests of Disney's Pop Century Resort enjoy features like an outdoor pool, a children's pool, and an arcade/game room. If you drive, self parking is USD $13.00 per night, or you can take advantage of the free airport shuttle (available 24 hours). The front desk is staffed 24/7 to help with tours or tickets, and answer any questions about the accommodations. Other amenities at this family-friendly resort include express check-in, express check-out, and laundry facilities. The resort has an outdoor pool and a children's pool.